"The Lakes at Waterstone" is a DiVosta/Pulte community of approximate 100 homes. It is a gated and master-planned waterfront community surrounded by small lakes and berms. Built in 2007-2009, Waterstone homes are low-maintenance designs with brick paver driveways and walkways surrounded by exquisite landscaping and plenty of walking trails. One thing that sets "The Lakes" apart, are it's bridges. 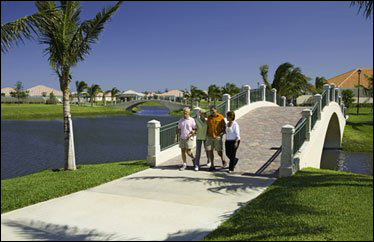 Paved walking and biking trails take you around and over the bridges with views of the lakes wherever you go. Along the way you can stop by the amenity center for a swim, use the exercise room, pick up some snacks, or play some tennis. And most likely you’ll probably meet some new friends doing the same. All just part of the day at Waterstone. 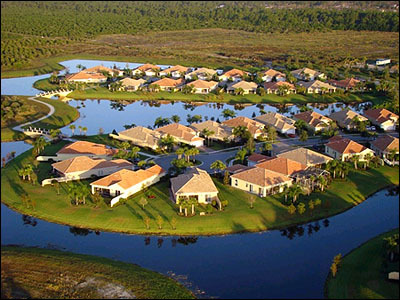 The Lakes at Waterstone is located on the southern edge of Palm Bay in Brevard County. The City of Palm Bay is conveniently located halfway between Jacksonville and Miami, right on Florida’s popular Space Coast where everyday is like a vacation. You can drive to the fascinating Kennedy Space Center one day. Another day just 75 minutes to the west, you can visit Orlando, home of Disney World, Universal Studios, and numerous other fun spots including the Orlando Magic. And then another day, you can find a secluded spot on one of the 72 miles of beaches, just 15 minutes to the east. If you just want to relax, you can lose yourself in a day of sport fishing off the sparkling coast. Maybe you might like to take in a round of golf at one of the area's 8 golf courses. Or best yet, just take a nap overlooking a lake. This is how your days will be spent when you come to Waterstone. Blessed with a thriving recreational and cultural scene, a variety of shopping experiences, and unlimited waterfront activities like surfing and swimming. At The Lakes at Waterstone, every day will be a day you’ll look forward to. This is a place you’ll love to be part of for years, and will love from the moment you step inside. Welcome to "The Lakes at Waterstone".